We are deeply disturbed by the news from the Housing and Land Rights Network (HLRN), part of the Habitat International Coalition (HIC), a global coalition of member organizations in over 100 countries, and the Nigerian organization Social and Economic Rights Action Center (SERAC) about the demolitions and forced evictions that started on 27 June 2012 and are still ongoing in Abonnema Wharf, Port Harcourt. We have learnt that the Rivers State government continues to embark on its plans to demolish the waterfront communities in Port Harcourt. Local sources have indicated that, although the government justifies these actions as a tactic to reduce criminal activities, it is clear that private business interests are guiding the demolition of these properties. Since 2008, many evictions have taken place in Port Harcourt, including the demolition of the Njemanze community, in 2009, resulting in the forced evictions of an estimated 13,800 to 19,000 persons; and the Bundu community, in 2009, where at least 12 persons were shot and seriously injured. The Rivers State government’s action is in flagrant disregard to national and international legal provisions. On behalf of the affected community, SERAC obtained an order of interim injunction restraining the Rivers State government from destroying the community on 11 November 2011 in Jim George & Others vs. The Executive Governor of Rivers State & Others (Suit No.PHC/2286/2009). A ruling on a contested application of the government to vacate the interim injunction was fixed for 2 July 2012. Despite the pending lawsuit and an interim subsistence order, the Rivers State government has proceeded, lawlessly, to destroy the community. The ongoing demolitions and evictions contravene the 1999 Nigerian Constitution, existing legislation, national policies and Nigeria’s human rights obligations under international law. Section 37 of the Nigerian Constitution guarantees the fundamental rights to privacy and family life. Nigeria’s housing policy formally recognizes both the right to housing as consistent with essential human need and the government’s corresponding obligation to ensure all persons’ access to adequate housing. These demolitions and evictions also violate the right to life and the dignity of the human person, as enshrined in sections 33(1) and 34(1) of the Constitution of Nigeria. The actions also contravene similar provisions under Articles 4 and 5 of the African Charter on Human and People’s Rights (ACHPR), ratified by Nigeria on 22 June 1983. Moreover, the real reasons for which Rivers State officials carry out these progressive Port Harcourt demolitions also may be in contravention of Article 14 of ACHPR, as they serve private interest and not the overall well-being of the public need or general interest. appalled at the great number of homeless people, and notes with concern the acute housing problem in Nigeria where decent housing is scarce and relatively expensive. The urban poor, especially women and children, are forced to live in makeshift shelters in appalling and degrading conditions presenting hazards for both physical and mental health. The current and the still-planned evictions and demolitions, with their grave human and material consequences, also violate the human right to private and family life, to access to justice, to work, education and health, all of which rights are guaranteed in the above-cited and other international and regional human rights treaties that the Federal Republic of Nigeria has ratified, as well as enshrined in its 1999 Constitution. The State of Nigeria has recognized its citizens’ congruent civil and political rights to information and participation, as guaranteed under the International Covenant on Civil and Political Rights. Nigeria ratified that treaty also on the same date as ICESCR in 1993. These rights, as integral to the right to adequate housing, are also supported in General Comments No. 4 (1991) and No. 7 (1997) of the United Nations Committee on Economic, Social and Cultural Rights (CESCR), which oversees State parties’ compliance with ICESCR. The international instruments recognize that "forced eviction are prima facie incompatible with the requirements of the Covenant and can only be justified in the most exceptional circumstances." To ensure these rights consistent with CESCR General Comment No. 7, it is understood that no one may be forcefully evicted without (1) effective and sufficient consultations with the affected parties, and (2) provision of appropriate and sufficient alternative measures. In other words, these minimum international norms guarantee that those who suffer eviction have access to appropriate measures, particularly alternative shelter, in order to secure an adequate living, and to assure sustaining economic activities where they reside. In relocating Abonnema Wharf community, the government has the further responsibility to ensure that the relocation site will fulfill the criteria for adequate housing according to international human rights law, including services for attaining water and access to employment options, schools, and health-care facilities. Follow scrupulously the principles of General Comment No. 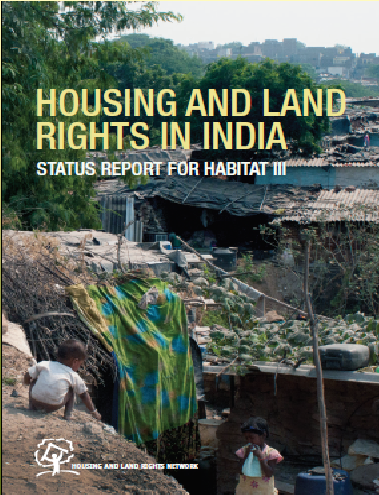 7 on the right to adequate housing: forced eviction, as well as the United Nations’ Basic Principles and Guidelines on Development-based Evictions and Displacement. Ensure equitable access to basic public services for citizens and inhabitants. HIC-HLRN also requests that the Government of Nigeria and Rivers State order an immediate end to such evictions, and respect all the conditions that Nigeria and its officials are obliged to observe as a prerequisite to such actions, in accordance with General Comment No. 7 of the UN Committee on Economic, Social and Cultural Rights. In so doing, it is essential also to establish a process leading to an impartial investigation that will review the facts, prosecute and punish the people responsible for any and all violations. HIC-HLRN also requests that the government order an immediate end to such evictions, and respect all the conditions that Nigeria is obliged to observe during such actions, in accordance with General Comment No. 7 of the UN Committee on Economic, Social and Cultural Rights, and establish a process leading to an investigation that will review the facts, prosecute and punish the people responsible for them. We look forward to hearing from you about your efforts to remedy the ongoing violations of human rights resulting from these eviction actions.